Rebecca is an up-and-coming Chinese American author. Within three months of its publication, Rebecca’s first book Green Apple Red Book: A Trial and Errors: A Memoir of a Chinese-American has already won three awards at New York, San Francisco and Hollywood book festivals. This narrative non-fiction uses the author’s real-life experience to put the American and Chinese systems of values and justice in perspective, as she shows the reversals of fortune and changes of fate and ambition in China and the U.S. through her journey. Born and raised in Chengdu, the capital city of Sichuan province in central China famous for its staple spicy food, Rebecca would have never expected that she now finds a bowl of Dan Dan Noodle as delicacy while passing up a slice of apple pie that she would have died for in her childhood deprived of sugary indulgence. When she first set foot on the American soil in 1990, China was a poor country in political turmoil. “When the Tiananmen Square Student Protest broke out in the spring of 1989, I was a junior majored in Electrical Engineering at the University of Science and Technology of China (USTC). China had just undergone sweeping economical reform under Deng Xiaoping’s ‘Socialism with Chinese Characteristics,’ but the government crackdown put the entire country back under dark cloud,” she recalled. “In the aftermath of June 4th, like every Chinese student who had participated in the protests and then forced to silence, I looked up to the United States as the promise land of intellectual freedom and democracy, and of course, better economical opportunities.” With only $250 in her pocket and a student visa, she arrived at Washington DC for her American Dream on September 11th, 1990, a day when the fewest chose to fly and plane ticket was the cheapest. Yet the reality is always harsher than the dreams. While Rebecca received tuition waiver from a pricy private university for her graduate study, she discovered that her entire stash would not even cover the rent-deposit for the cheapest apartment in Washington DC. As a twenty-year-old with nothing, or nothing to lose, she took upon adversities as adventures. 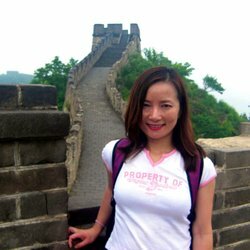 “I went to Chicago, where the few Chinese students I knew, all from my undergrad alma mater USTC, became my much-needed family and support group.” As she vividly recounted her first few months in the U.S. in the chapter aptly titled Land of the Free, she overcame the hardship with hard work and “a streak of luck with incredibly kind people from all walks of life.” Rebecca credits her early survival in the new continent to the buddy system among Chinese students who had arrived earlier. In the 1980s and the early 1990s, few ordinary Chinese could afford the living expenses on American campuses, let alone tuitions. Those who came from mainland to the U.S. on student visa were likely graduate students with scholarship in “hard” science or those who had to work to pay for their own schools. “Eying the relative resources of an average American particularly the right to work that I saw as an enviable privilege, I had once felt inferior and insecure as a ‘poor’ Chinese,” she recalled. “We had to take any menial work we could find, sometimes ‘undocumented’ and exploited, to simply pay for rent and food. Since full-time professional employment opportunities are limited to ‘practical training’ for student visa holders, we had to do better than the other students with the privilege of Permanent Residency or citizenship. We studied and worked very hard, I for one not necessarily by habit from China’s rigid education system, but out of this keen awareness that as an economically disadvantaged group we had started out with less so we must do more. In order to be hired by an employer who would sponsor work visa (H1), it was well accepted that we had to perform better than the candidates with ‘free-to-work status’ to show the employer that we can offer more. And we couldn’t even dream about taking the ‘risk’ such as working for a start-up that might not be there to validate our work visa.” Luckily, hard work paid off and Rebecca followed the beaten path among Chinese graduate students: she got her Master’s in electrical engineering from Purdue, then an MBA from University of Chicago Booth School of Business, and landed the best jobs possible at the time at big companies like Motorola, Lehman Brothers, Merrill Lynch and made her career transition from technology to financial services. After several relocations including two year of cushy expat life in London, Rebecca and her husband, also a Chinese native and a Chicago economist by training, settled down in San Francisco, where they started their family and bought their first house. They later moved to the east coast where they continued the all-too-familiar low risk upwardly mobile path of building dual careers while raising family in an affluent education-focused community. Rebecca found herself not only acclimated to but entrenched in the so-called upper middle class life. “I had lived in the proverbial American Dream,” she assessed her well-managed life that had seemed devoid of the usual midlife crises. However, an incident in 2009 made her change her career, and outlook for her two countries. With an engineering and finance background, Rebecca had never thought of becoming a writer, let alone write a book about her own trials and tribulations, in her second language, which would be published in the U.S. and win several literary awards. “It all happened in 2009 when I visited China as a naturalized American citizen,” she said. It was right after the Beijing Olympic games and the world financial crisis triggered by Lehman’s collapse, China became a power player on the world stage. And it was also the year of the H1NI virus outbreak. Rebecca and her family were detained and quarantined by the Chinese government that had determined to “contain” the virus in China at all cost. The experience of being forcefully separated from her loved ones and losing personal freedom for merely a week made Rebecca deeply appreciate the American way that she had taken for granted. But after she finally made it back to her home in Philadelphia suburb, something more outlandish happened: she was sued by a woman who lives thousands miles away, an employee of Apple Inc. who seemed to “have it all,” even high blood sugar. Rebecca hardly knew the plaintiff. The only connection was her brother, a gifted Vietnamese American with degrees from Cal Berkeley and the University of Chicago who had vanished. “This lawsuit may sound improbable even to those Americans who are used to our litigious society,” Rebecca said. “But I had to come to Santa Clara Superior court in San Jose to sit through the jury trail that had lasted three weeks.” The trial became part of her memoir Green Apple Red Book: A Trial and Errors, in which she cites the actual court transcripts to caricature the Kafkaesque experience. However, even in America, there was a price to pay for free speech. In order to publish her book, Rebecca had to resign from her long-time job as a financial advisor at a large financial services company because the company would not permit her to publish the book. As the book gains critical acclaim in book festivals of major cities in the U.S., Rebecca has been touring both her adoptive and birth countries, hoping a Chinese edition will be published in both China and the U.S.
As she revisits the roads traveled, she reflects on the future. “I am fortunate to be living in the two greatest countries in the world. I take pride to be a self-made American of Chinese heritage. If there is such label as Chinese-American, I wear it as a badge of honor. Even with the most recent slowdown, China is growing rapidly and catching up to the U.S. in wealth and power. As a result of China’s great economic boom of the last two decades and the recent capital outflow, many more Chinese immigrants now come to the U.S. with vast economic opportunities that the earlier generations had never experienced or imagined. What does Chinese or American way really mean to them? What are the core values of the two cultures? Is there a Chinese-American way, or rather, American-Chinese way?” Rebecca hopes her book gives nuances to the cultural debate and challenges readers to reflect on the two richest cultures. Rebecca intends to use the book as a means to reach out and give back. She donated the proceeds of her first book event to SOAR Foundation, a Silicon Valley based non-profit that provides scholarships to impoverished children in rural areas across China. To show and not tell, is her ambition of the book. Rebecca was interviewed by Fei Chu, a volunteer with the Made Into America project.